The A5 Diamond Spectrometer is designed for high-precision spectroscopy of heavy ions. It is used for research in radiochemistry, nuclear medicine and heavy ion physics. The Diamond Spectrometer is a robust spectroscopy tool which can be used in hot environments as well as in vacuum applications. The system provides an energy resolution of 20 keV FWHM, intrinsically matched to the spectroscopic properties of diamond detectors. Energy straggling of the heavy ions is kept to a minimum by the dedicated technology. with integrated power supply and GUI, for real-time heavy-ion identification. Open-Design Diamond Detector for non-collimated spectroscopy. Cx Spectroscopic Shaping Amplifier with Gaussian output signal of 1.2 μs FWHM, for measurements with a conventional multi-channel analyser (MCA). Full Diamond Spectrometer System including ROSY® AX106 with Spectroscopy Application for real-time particle spectroscopy. Full Diamond Spectrometer System including ROSY® AX106 with Spectroscopy Application and integrated HV and LV power supply for detector and amplifier, as autonomous laboratory system for particle spectroscopy. 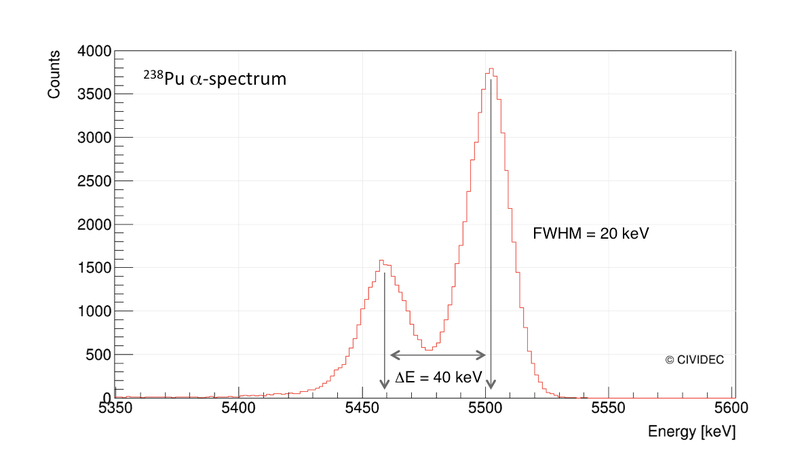 The deposited energy spectrum by α-particles from 238Pu, recorded with the A5 Diamond Spectrometer and the ROSY® AX106 Real-Time Spectroscopy Application is shown in the Figure. The excellent energy resolution of the system allows resolving the two different α-particle energies, which are separated by only 40 keV. The very low noise level of the included Cx Spectroscopic Shaping Amplifier allows very small trigger levels. 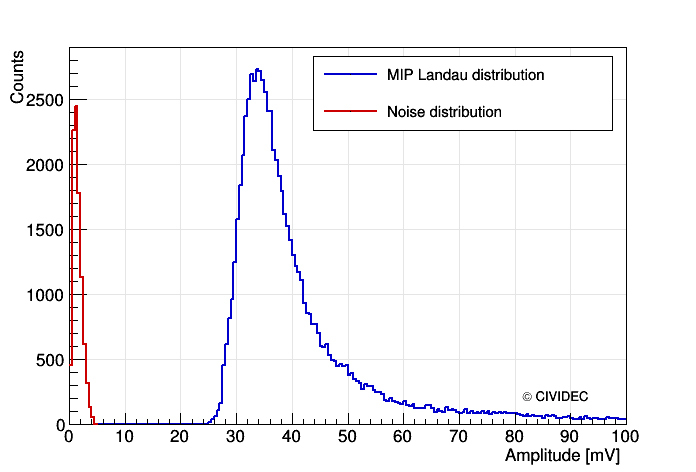 This makes it feasible to record the full Landau distribution of Minimum Ionizing Particles (MIP) with excellent signal to noise separation. The presented measurement in the Figure was performed with the A5 Diamond Spectrometer and the ROSY® Spectroscopy Application at the CERN Proton Synchrotron (PS) Accelerator in a Telescope experimental setup. The Landau distribution is well separated from the electronic noise. The Diamond Spectrometer was developed for the n_TOF facility at CERN for the spectroscopy of nuclear reaction products.